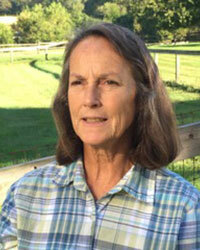 Blair W. Fleischmann, an Upper Oxford resident, is one of the Landscapes3 Steering Committee members. She is the current executive director of S.A.V.E. (Safety, Agriculture, Villages & Environment). Fleischmann serves as treasurer of the Chester County Historic Preservation Network and secretary of the Upper Oxford Township Historical Commission. She is a trustee of the Homeville Cemetery Co. and treasurer of the Oxford Regional Emergency Management group. She also serves on the Conservancy Committee of the Brandywine Conservancy and was previously on the boards of Chester County 2020, the Octoraro Watershed Association, and the Oxford Area Historical Association. Fleischmann is a former staff accountant and lives with her husband, Charlie, on a preserved farm in Upper Oxford. “As residents of Chester County, we are fortunate to have a countywide public process that will result in an updated planning document that can and should be used in order to preserve our precious natural and cultural resources, as each of the 73 municipalities play a critical role in helping to shape our future,” said Fleischmann. For more information about Fleischmann, click here.